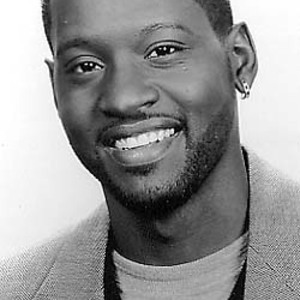 Johnny Gill (born May 22, 1966 in Washington, D.C., United States) is an R&B singer best known as a member of quintet New Edition. Gill, the son of a minister, started singing at age five in a family gospel group called "Wings of Faith". His solo career began in 1983 when his childhood friend, singer Stacy Lattisaw convinced him to record a demo. The demo he recorded fell into the hands of the president of Atlantic Records, and his self-titled debut album was released shortly thereafter. Gill, the son of a minister, started singing at age five in a family gospel group called "Wings of Faith". His solo career began in 1983 when his childhood friend, singer Stacy Lattisaw convinced him to record a demo. The demo he recorded fell into the hands of the president of Atlantic Records, and his self-titled debut album was released shortly thereafter. Then, Johnny teamed up with Stacy for a duet album, which featured their first together, "Perfect Combination", a second album on Atlantic Records, Chemistry, yielded the song "Half Crazy,". Gill's big break came in 1987, when he replaced Bobby Brown in New Edition, a 1980s pop group. With Gill as one of the lead singers, the group developed a more mature, adult sound, hitting the charts with songs such as "Can You Stand The Rain," "N.E. Heartbreak," and the Johnny Gill lead "Boys To Men". During a hiatus from New Edition, Johnny embarked on a solo career. The hits from his self entitled 1990 album include "My, My, My," "Rub You the Right Way," "Fairweather Friend" and "Wrap My Body Tight". On this album, Gill played guitar, bass, bongos, and drums in addition to performing his lead and background vocals. In 1993, Gill released another solo project, Provocative, which included the songs "Quiet Time to Play," "A Cute, Sweet, Love Addiction," and a gospel song, "I Know Where I Stand." In 1996, Gill was reunited with his New Edition bandmates, including Brown, as they recorded Home Again together, an album noted for the singles "Hit Me Off" and "Still In Love". Gill also released Let's Get the Mood Right in 1996, which included the title song, "Love In an Elevator," and "Maybe." The following year, he collaborated with Gerald Levert and Keith Sweat to form the supergroup LSG (Levert/Sweat/Gill) which resulted in the multi platinum debut album, Levert-Sweat-Gill, and a follow-up album entitled LSG2. Gill, the only member of New Edition who is not from Boston, was raised in Washington DC where he attended Kimball Elementary and Sousa Junior High. His career dictated that he complete his high school education through the services of a tutor. Johnny had planned to attend college and pursue a degree in electrical engineering, but his career came first. His latest recording, "You For Me (The Wedding Song)" from the Madea's Family Reunion Soundtrack received strong reviews from music critics as well as the general public. As of 2006, he is still performing with the group as well as performing solo as part of the Body and Soul Tour, which includes fellow NE members Bell Biv DeVoe. At the 2011 BET Awards, he announced that he will be releasing a new album, after a 16 year hiatus.